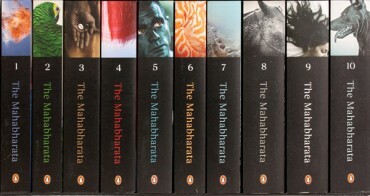 Can anyone tell a good book of Mahabharata in English version? Are there any other versions available? I know this is a meta question but don't have enough reputation to ask in meta. A good English version translation is by Kisari Mohan Ganguli. It is complete scannable and full translation. Here are some book recommendations by Shatavadhani Dr. R Ganesh from his YouTube video How do I get into the world of Mahabharata? Where do I start? Yudhishthira is a vast tree, formed of religion and virtue; Arjuna is its trunk; Bhimasena, its branches; the two sons of Madri are its full-grown fruit and flowers; and its roots are Krishna, Brahma, and the Brahmanas. Unabridged, verse by verse translation. Not sure who the author or publisher is - the website ingeniously removed all those details! This mentions both those trees, so better compared to the above tr. Duryodhana is like a great tree created out of anger, Karna is its trunk; Shakuni is its branches; Dushasana its fruit and flowers and weak Dhritarashtra is its root. Yudhishthira is a great tree, created out of virtue and religion; Arjuna is its trunk; Bhima is its branches; two sons of Madri are its flowers and fruits; and Krishna, Brahma and Brahmanas are its roots. Not the answer you're looking for? Browse other questions tagged mahabharata translation-request . What are the 8.4 million species? Many versions of Ithihasa and Puranas, which versions can be true?